Edinburgh Monarchs No.1 Ricky Wells has not written off leading his side to the end of season play-offs but admits it will take a big effort to finish in the top four which is the gateway to Championship League glory. To that end Monarchs beefed up their misfiring squad this week by signing Swedish star Victor Palovaara to replace Argentinian Coty Garcia who tried hard but lacked impact. Wells said he hasn’t given up on reaching the play-offs and concluded: “There is always a chance we’ll qualify but it is going to be difficult. Last year we started off strongly but then faded towards the end of the season when we needed to be strong. “We all have bad matches,me at Ipswich and Max and Joel have also had bad matches. For now Wells, the New Zealand-born American, is concentrating all his efforts on tonight’s big Knockout Cup quarter-final first-leg tie against Berwick Bandits at Armadale which realistically represents Monarchs’ best chance of clinching some silverware this season. The Bandits are flying high in the league right now and given that Monarchs are hanging on by their fingertips to win their home matches every week, this evening’s encounter is anything but straight forward. Monarchs have toiled to kill teams off at Armadale and Wells believes this is down to certain riders struggling for form. He said: “I see people struggling on every night, whether it’s me or someone else, it’s tough. “I think track conditions at Armadale this year have been very slick and that makes it easier for visiting riders to come and do well. Riders like Matej Kus and Nicolai Klindt have all come up and scored some big points. New boys Max Ruml and Joel Andersson have not made the progress the management had hoped for but Wells thinks it’s a bit unfair to single them out for criticism. “The Championship League this year is tougher than it’s ever been and there are some very tough teams in it. Sides like Glasgow and Workington are stacked out with good riders all the way through and it’s hard for some of our boys. “Also there are some technical tracks around like Berwick and Newcastle and Ipswich it’s not easy. Coming from America as Max does it’s pretty different to what he is used to back home. I did the same thing a few years ago and went straight into the Elite League and it’s so different. Coming into the UK Max had been used to riding 100 metre tracks in America. Suddenly he goes to somewhere like Berwick which is massive by comparison and trying to get round those places is very hard for the guy. “I personally don’t think Berwick will push us that hard tonight. But Berwick are very strong at home and this makes for a strong basis for them to have a good season and that is exactly what they’re enjoying right now. “I think we can run Berwick closer in the second leg. “We lost 53-37 two weeks ago in our concluding Championship Shield match but Max and Joel will be visiting for a second time and they should do better on this occasion. 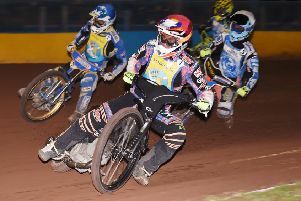 Wells’ own form has been consistent and the rider is satisfied with how things are going at the halfway point of the season. “It’s been pretty good apart from that one match at Ipswich last week where I struggled. Monarchs are also in action in the Championship Fours event at Redcar on Sunday.